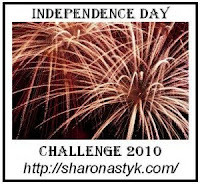 Lately my Independence Days Challenge updates seem to be reporting the same thing over and over and over. There is little variation week after week. There are also times when I've been busy all day, but when DH asks me, "So what did you do today..." my report seems pretty lame (did it really take me 3 hours to pick a gallon of blueberries???) At times like that I feel like I'm not being very productive, just spinning my wheels. Do you ever feel like that? That's when these updates are most helpful. I can look at my lists and see the fruit of my labors. I truly am starting to reach my goal! That's encouraging. 1. Plant something - delayed by rain! canned more pizza sauce. In fact I made my quota of 26 pints this week and then some! My summer read is Animal, Vegetable, Miracle: A Year of Food Life by Barbara Kingsolver. It's got me contemplating "local." More on the book later, but it's helping me realize that building community food systems isn't only done by teaching and sharing. Community food systems are also built by purchasing from local farmers and food producers. With that in mind I can report that I bought a gallon of local raw milk, a 2 lb roll of locally produced butter, and 2 pounds of locally produced ground beef (pasture raised, grass fed, no antibiotic or growth hormone; isn't there a way to abbreviate all that???). These aren't specifically "want not" items, i.e. for food storage and future needs, but for this week's use. Purchased chicken and goat feed produced by area farmers. 7. Eat the food - I thought I'd try to look at this from a different perspective. Rather than simply make a list of what we've been eating and sprinkle it with a few recipes, I want to categorize it in a way to help me better analyze our current consumption and food storage. Proteins - we have our own eggs and quite a bit of homestead raised chicken in the freezer. I purchase the locally ground beef (we like grilled hamburgers) I mentioned under "build community food systems, and also bulk meat packs of locally pasture raised pork (chops, cutlets, sausages, bacon, ham steaks, etc), also grass fed with no antibiotics or grown hormones, humanely slaughtered, yadda yadda) We also eat a lot of yogurt, and for this I've been buying non-homogenized milk from a local dairy, but it's ultra pasteurized and I've recently learned this may be why my yogurt isn't setting well (hence the purchase of raw milk mentioned above). Starches - our sweet corn didn't do well, so that's a disappointment. We recently harvested our potatoes and are pleased with that. I'm just not sure how well they'll store (summer still has a long way to go for us), Hopefully the ones planted for a fall crop will do well. We'll see. Grains & flours - Not sure what I can get grown locally. I buy quite a bit in bulk (brown rice, oatmeal, millet, buckwheat flour) and do soak all our grains and flour. I'm using sourdough starter in every flour product I bake. Fats - I bought 2 (& won 1) gallon buckets of organic palm shortening (non-hydrogenated) from Tropical Traditions and use those anytime I need shortening (pie crusts mainly). I also purchased a 5 gallon bucket of coconut oil, plus I use a lot of virgin olive oil (bought in 1/2 gallon containers). I'm saving and using the fat from the local grass fed pork I buy, because it contains no antibiotics nor growth hormones. For table use and some cooking/baking I purchase that local roll butter. Sweeteners - purchase local honey by the quart (and get $1 off for providing my own container.). Also maple syrup (the real stuff, not local!). I get raw sugar at the discount grocery when available, and I still buy refined white sugar for coffee and jam & jelly making. . Herbs, spices, & condiments - I'm working on this one with my culinary herb garden. Otherwise I try to purchase these, plus sea salt, in bulk quantities. I still purchase apple cider vinegar by the gallon for pickle and relish making. My goal is to eventually be able to supply almost all of these myself. Beverages - We drink mostly water (ours is city and terrible). I fill a big glass pitcher with it and leave it sit 24 hours to evaporate the chlorine out of it. I broke my sun tea jar and haven't been making tea. I really need to but haven't been able to find a glass one, only plastic :(. We do drink coffee and (horrors!) soda with our Friday night pizza! I need to get back to trying to perfect that ginger beer recipe! I think that's it for this week. To see what others are doing for Independence Days, click here. My "Can You Believe It's August Already!" IDC Update © August 2010 by Leigh at http://my5acredream.blogspot.com/ (both photos & text). I've got to pick green (purple) beans today; they got away from me last week when I had to work at Rick's clinic. I don't have a pressure canner and dislike frozen beans, but am thinking I need to give the latter a try. Do you freeze beans and can you recommend a good method? In the end, of course, all such tasks are beneficial, but it does seem like you are spinning your wheels most of the time. We've just got to give ourselves a break. Growing your own food, taking care of animals, having even a small homestead is such a full-time job. A life style. Michelle - Just saw your comment. We LOVE frozen beans; they're so much better than canned. Be sure not to let them get too big or tough before picking. Take off the ends and snap or cut them into pieces. Blanch them for 3 minutes then immerse in ice water to stop cooking. Drain well. Then I actually spread them on a towel, roll them up and let sit for a minute or two to remove excess moisture. Then put into a gallon freezer bag. They stay frozen "unclumped" and I take out just as much as I need for serving. yep, I know how that "not doing much" feels... but after some time of just spinning - there comes a time when I manage to finish stuff, to show what I did with my time.. when fall/winter comes for you, you'll be able to show full shelves etc.. of course, not many people (apart from your blog readers:)) outside your home will see this - but you can pat your own back and lean back for a while! You sound very productive - gardens take lots of time, but it can be so enjoyable as well. We are lucky to have an underground root cellar built into the hillside. Yes Leigh: I can feel like that. There are days when I say: I haven't done anything at all, but have spent hours cleaning things in the house or working in the garden. But as soon as I've done something 'textily' I feel I've done something... My spinning wheel is worked at lot, but so are the lace bobbins and I've even woven again this week! My knitting needles are kept busy as well. The birds ate my berries and currants, so no need to can any... It was too dry for them here this year, so they didn't very well either. Thank-you, Mama Pea. I've got green beans in the freezer as I type; we'll see how we like them! Michelle, the photos of your purple beans are so pretty. I need to try them sometime. I can my green beans, a habit I got in to when we didn't have a deep freeze. I know some folks prefer them frozen, but we just like them canned because that's what we're used to. I do love having a pressure canner, because it increases the possibilities of food preservation. Mama Pea, weeding, that's another one! "You spent the day weeding (accompanied by a blank look), oh." I agree homesteading is actually a lifestyle, and really can't be compared to what the rest of the world thinks of in terms of productivity. Thank you too, for the info on freezing green beans! Bettina, it's helpful to be reminded of that and it's true, that as I fill my pantry shelves, I am reminded why I'm doing it all. Evelyn, I envy that root cellar! We have the pantry, but really, a root cellar would be the best place for the potatoes and other root crops. The side of a hill is the perfect spot, too. Annie, that is so true! Housework seems unproductive but spinning, knitting, and weaving seem productive! I reckon that's due in part to the fact that housework has a way of forever "undoing" itself. LOL. Michelle, I'll be curious about that too! Thanks for the link! They have just what I'm looking for. Good prices too.